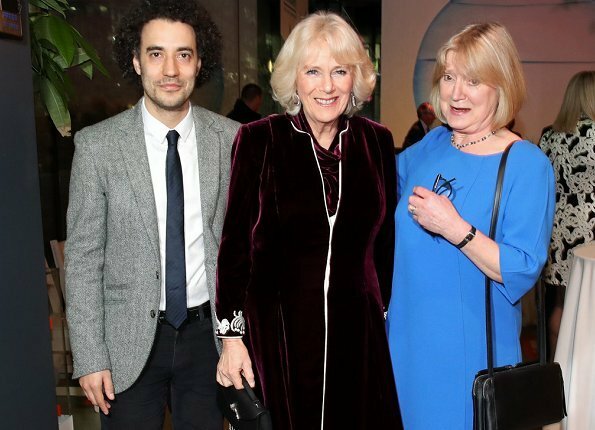 On February 6, The Duchess of Cornwall attended a reception to mark the launch of "Glorious Grandparents" initiative at Unicorn Theatre. 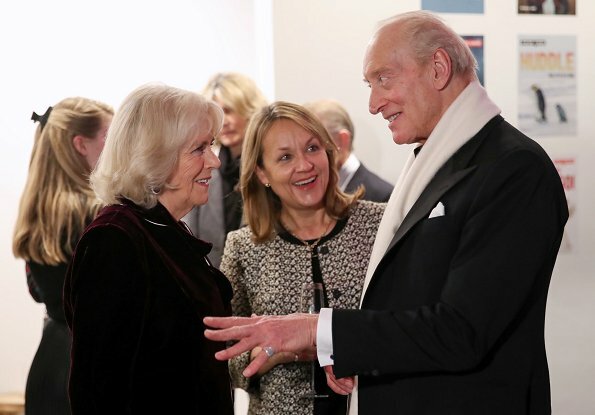 The initiative aims to encourage its supporters to bring their grandchildren to the theatre. 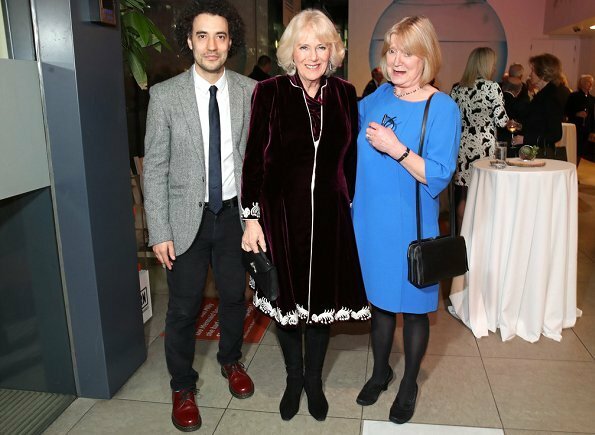 Established in 1947 as a touring company, Unicorn Theatre serves young audiences aged between 2-21. 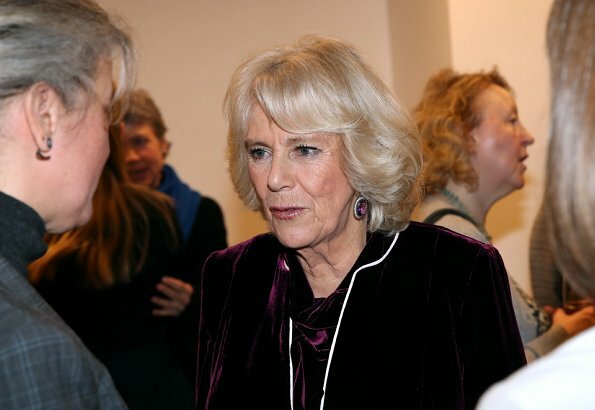 The Duchess is a keen supporter of the arts and became Patron of the theatre in 2005. 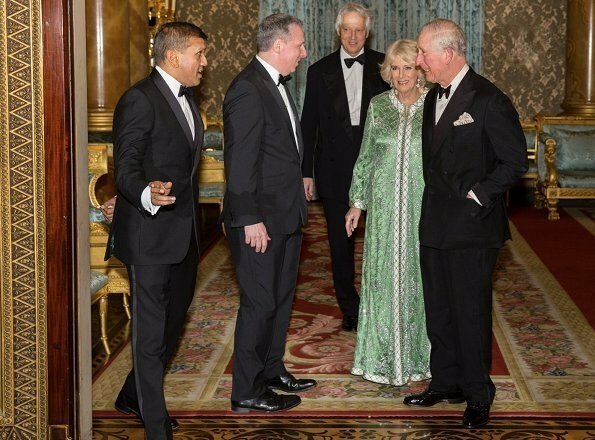 On February 5, The Prince of Wales and Duchess of Cornwall hosted the British Asian Trust’s (BAT) annual dinner at Buckingham Palace. 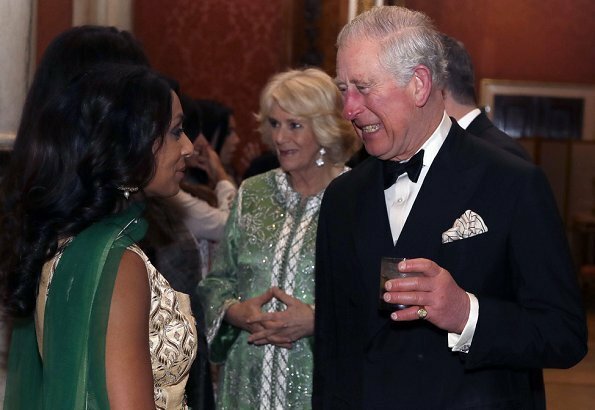 During a reception for supporters of the charity The Prince and The Duchess met BAT Ambassadors including model Neelam Gill, radio and TV presenter Neev Spencer and director Gurinda Chadha. 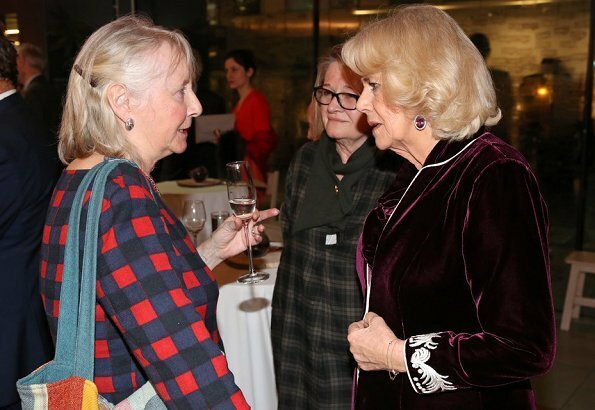 I think the fabrics she chooses are lush and lovely, but the shape of the garments is boring, especially the emphasis on a long and very obvious center-front line. They then look like bathrobes. How about a defined waist area or a fancier collar? Perhaps she has found the right silhouette for her figure and finds it the most comfortable. She mixes up the fabrics and colours well. I admire her bespoke outfits a lot. KH, I thought the same thing when I saw the first outfit. Bathrobe. The second outfit is more of the same. 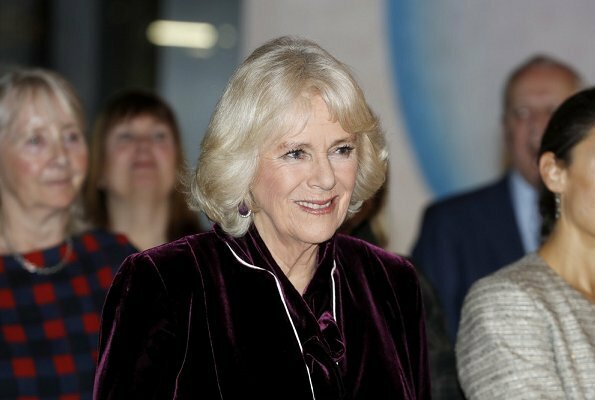 I very rarely comment on Camilla's clothes because I don't have many positive things to say. 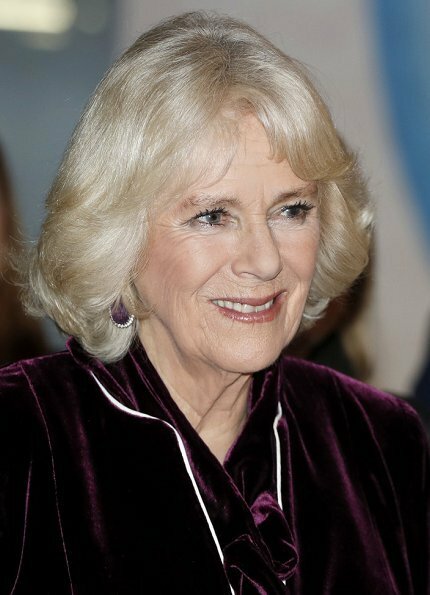 Camilla does not have much of a waist, so I would think a good designer would work hard at trying to define a waist for her. Her breasts are very low. I wonder if she has good bra fitter. I would assume she does, but it doesn't look like it. I would like to see what a fresh designer could do for her. Love the makeup and earrings and her genuine smile. I agree, and I like her a lot. 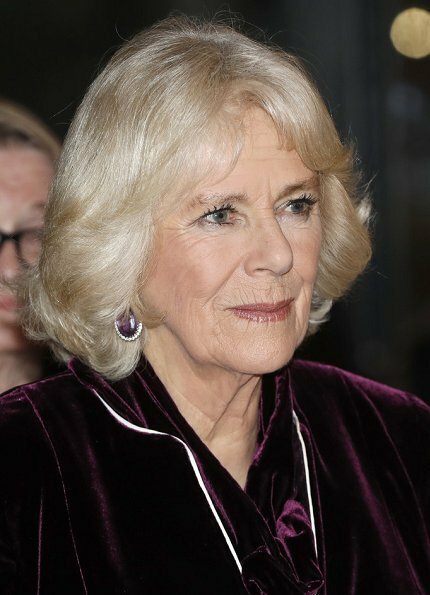 The berry-colour-velvet, earrings, hair: very lovely. 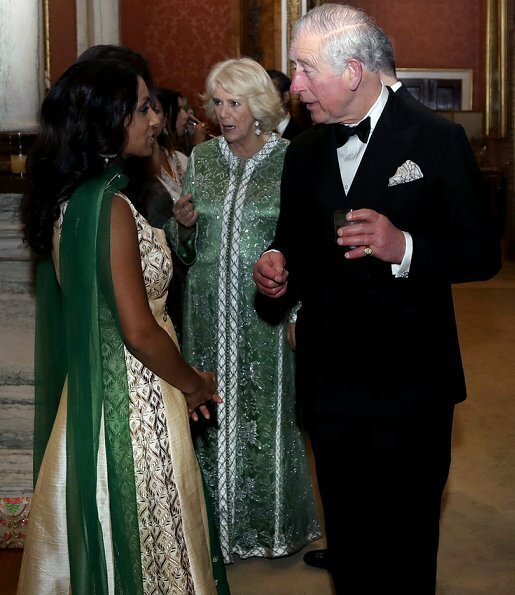 Although, like KH mentioned, the style and shape of both outfits are not the greatest on this occasion. Agree with the comments regarding the style and shape of these outfits, not the best.